Saguenay Lac-St-Jean is one of my favourite Quebec snowmobiling destinations. It’s located a two-hour drive north of Quebec City on the four-lane Highway 175. 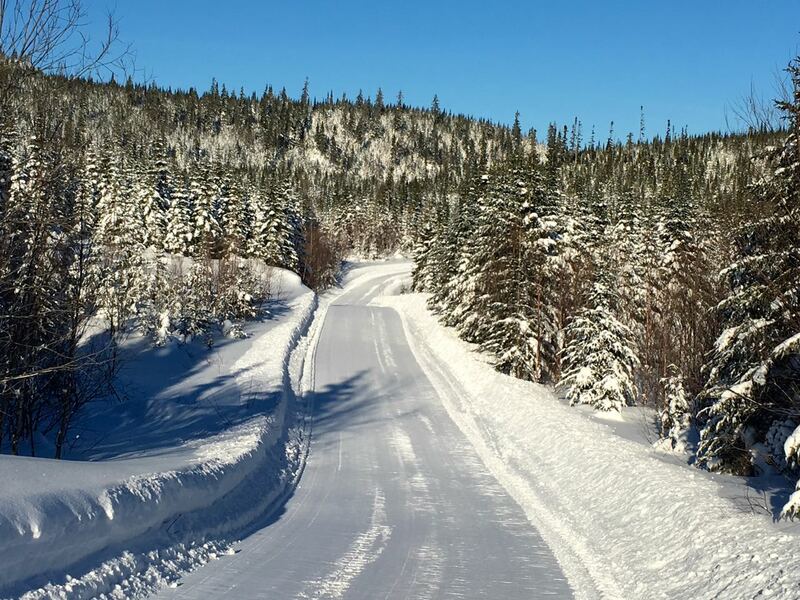 Here, the Saguenay Lac-St-Jean region delivers consistent and reliable early, in season and late snow conditions for a great Quebec snowmobile vacation. So that’s where we trailered when January rain and thaw made trail conditions and snow conditions sketchy elsewhere. 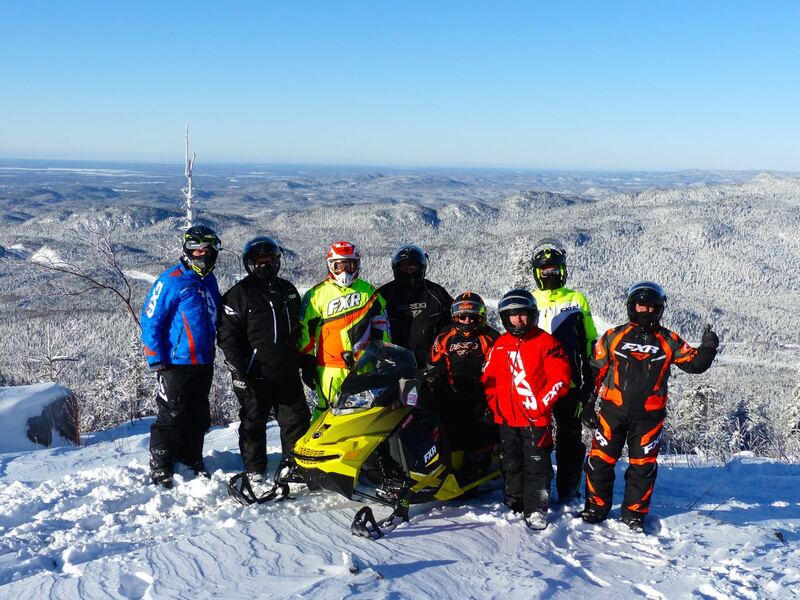 Nine guys participated in this Quebec snowmobile tour, a client appreciation ride hosted by Brent Murphy Insurance. 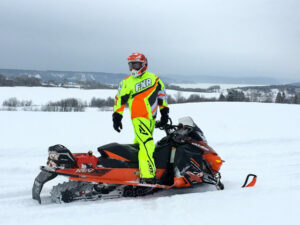 Our mission was to snowmobile three different rides, staging from the same hotel each day. Preferably without repeating trails. This way, we didn’t have to pack saddlebags. We could also decide where to point our snow machines each day, depending on snow conditions. And what the group felt like doing after breakfast each morning. 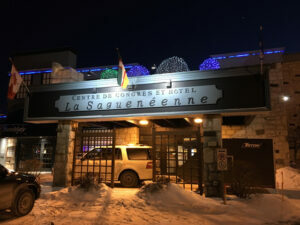 For this Quebec snowmobile tour, we chose Hotel La Saguenéenne in Chicoutimi as our staging site. With direct trail access, this full service lodging is centrally located in proximity to stores, restaurants and gas stations. It also provides plenty of parking for trucks and trailers, and several secure sled garages. Amenities include indoor pool and hot tub, an on site restaurant/bar and comfortable beds. Tip: the easiest access gas station near the hotel is the Ultramar located about two klicks away along the access trail. Day one was overcast and snowy. 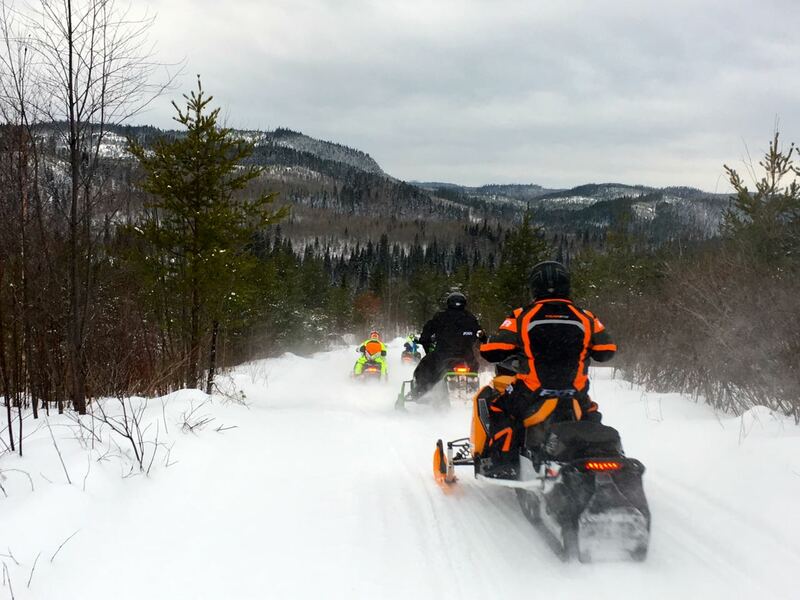 We snowmobiled a 230-kilometre, hill country loop east from Hotel La Saguenéenne on the fresh powder, covering Trans Quebec 83 and back on Regional Trail 383. With many other trail options available, we could have made the ride shorter at about 180 klicks or longer at about 320. Day two dawned sunny, bright and perfect for sight seeing. So we decided to trailer across to Monts Valin on the north side of the Saguenay Fiord and stage from the parking lot at Valinouet ski area on Trans Quebec 93. We could certainly have snowmobiled there directly from the hotel. But that would have added about 100 kilometres total to our ride and meant having less time left to explore the famous Monts Valin area. Monts Valin is popular for its massive snowfalls, unique mix of great trails and backcountry riding opportunities. And for the Five Summits – scenic lookouts best experienced on a clear day like this one when we could see to the far horizons. 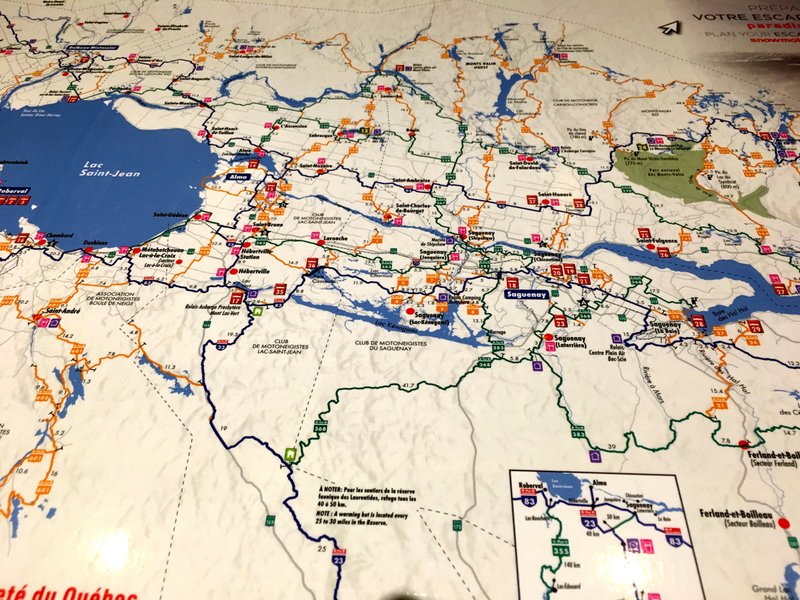 We snowmobiled from Hotel La Saguenéenne on day three, heading west on Trans Quebec 83 and Regional Trail 367. Then we crossed the Saguenay Fiord on special snowmobile lanes added to road bridges. One even had its own set of traffic lights! From there, we hopped on a primo Trans Quebec 93 westbound to Sainte-Monique. Here we rode the equally remarkable Regional Trails 367 and 328 back. This journey was 244 kilometres. But once again could easily have been shortened or lengthened by taking other trail options. Most of our group hadn’t snowmobiled in Saguenay Lac-St-Jean before. The consensus was absolutely superlative. Not only was there abundant snow, smooth trails and good access to restaurants and fuel. But there was also an impressive variety of terrain and scenery. What’s more, based on my previous visits there, I know we could have snowmobiled at least two more full days without much trail repetition. So the next time you’re looking for an outstanding Quebec snowmobiling destination, you’re guaranteed to come home smiling when you choose Saguenay Lac-St-Jean. No wonder it’s called Saguenay snowmobile paradise!